On Monday, November 12th, the Adams State Percussion Ensemble will put on their bi-annual Percussion Extravaganza in Richardson Hall Auditorium at 7pm. 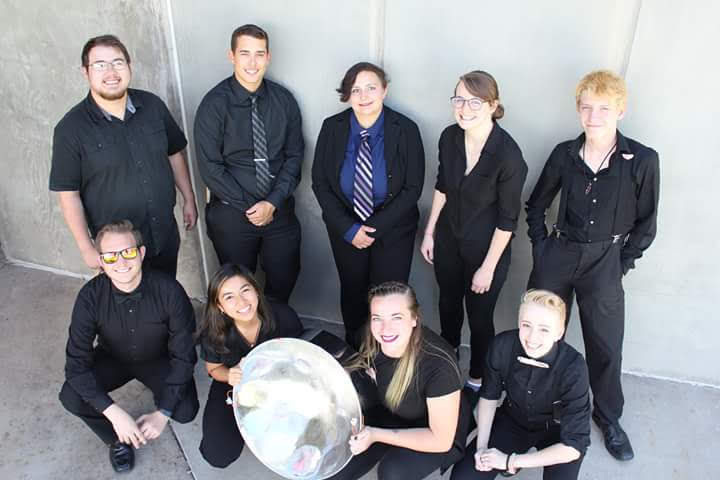 Each semester, the percussion students at Adams State work intensely to prepare a show to represent the music department and to demonstrate the musical skills that the students develop each year. This semester’s program is titled “Affinity,” directed by Dr. James W. Doyle, and will consist of classical works by a great variety of composers. These works exemplify a vast diversification of composition styles and feature several musicians, including special guest Dr. Sarah Off, a native of the San Luis Valley. Off will be featured playing violin on Lou Harrison’s famous “Concerto for Violin with Percussion Orchestra,” an expressionionistic piece that first premiered at Carnegie Hall in 1961. Dr. Off served as the artistic director of the Mt. Blanca Summer Music Conservatory, as well as an instructor for the Music in the Mountains Conservatory in Durango, and has traveled from her home in Phoenix back to the San Luis Valley to perform with the ASU Percussion Ensemble. The ensemble will also perform Steven Mackey’s thought-provoking piece, “Madrigal,” featuring Adams State Voice Professor, Dr. Matthew Valverde. Through the lyrics of this piece, Dr. Valverde illustrates the frustration and acceptance of the thievery of time, persisting the listener to live in the present and to release anxiety of the future and depression of the past. Dr. Tracy Doyle, Adams State Professor of Music, will be featured in the groove-inspired “Hammers,” by Allison Loggins-Hull, for flute and percussion trio. Award-winning composer, Marilyn Bliss, will be represented in this unique program, along with Pulitzer Prize winner Steve Reich. Bliss’s ethereal piece “Aurora Borealis” will be accompanied by depictions of the aurora phenomenon while an all-female arrangement of the percussion ensemble plays. Reich’s famous piece, “Clapping Music” will be demonstrated, and soon after, “Clapping Music Variations” by the drummer of the rock band Wilco, Glenn Kotche, will be performed. “Affinity” will be an intriguing performance for all and provide a fun Monday evening for students and faculty to kick off the last week before Thanksgiving break. The concert is $5 for adults, $1 for students, and free to AS&F and Friends of Music. The Adams State Music Department can provide more information at 719-587-7621.